We offer a selection of top quality Nitrous Nozzles. Below you will find fogger nozzles that spray fuel and nitrous together, dry nozzles that simply spray nitrous, and nitrous and fuel jets to calibrate the amount of nitrous or fuel flowing through your nozzles. Introducing the ALL NEW Cold Fusion Predator Nozzle! This Patent Pending 90 Degree Annular Nozzle Hands Down makes more power & earlier than any nozzle tested using identical jets. This nozzle out performed all other nozzles we tested including Cold Fusion standard nozzle, NOS soft plume, NOS B nozzle, Cold Fusions annular nozzle, NX Shark nozzle, TNT 90 degree nozzle and the Nitrous Works 90 degree nozzle. And to make sure everything was relative we used the same jets in all tests, even if even it required boring the jet holder region of the nozzle. For being the best Nitrous Nozzle on the market it's Reasonably priced at $44.95!! For use with gasoline, soft plume-style, 90 degree Soft Plume Fogger nozzle, comes with fittings! 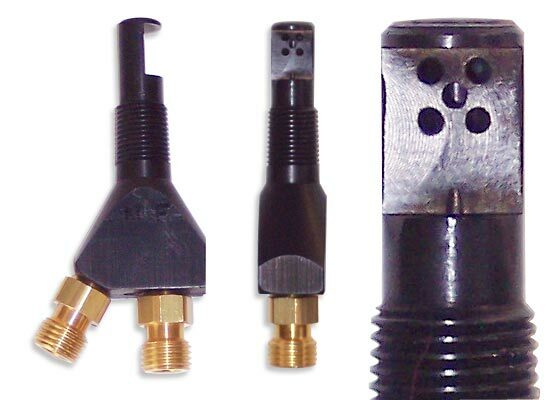 For use with gasoline, soft plume-style, 90 degree Fogger nozzle, comes with fittings! Fits in fuel injector port (your fuel injectors sit in our nozzle. Very trick, clean install no drilling or tapping required.